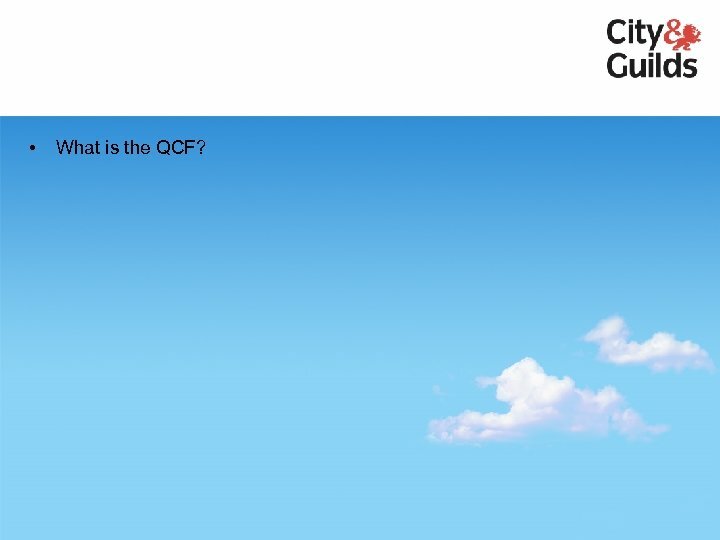 • What is the QCF? What is the QCF? Recognises achievement, through the award of credit for units and qualifications. It provides more flexible routes to full qualifications, achievable in smaller steps. New standardised titles will make it easier to understand compare. Greater commonality through shared units and a standard unit template. A new centralised database, due in late 2010, will help to track credit and provide learners with an online record of their achievements. 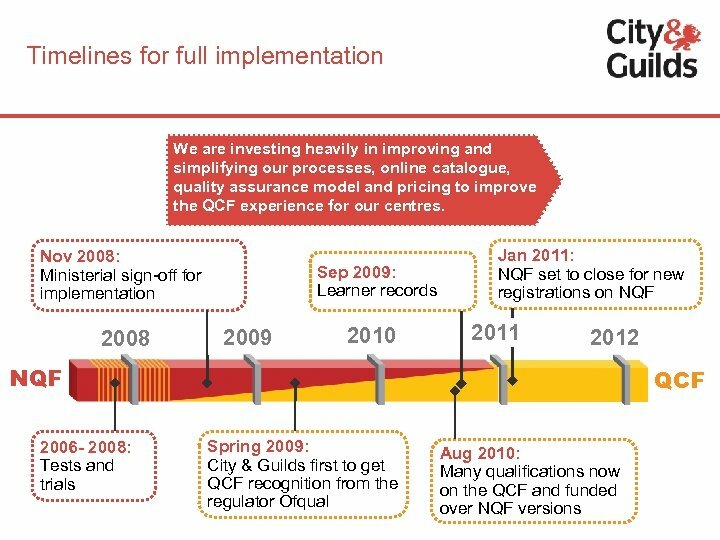 The implementation of the QCF is already well underway in some sectors. 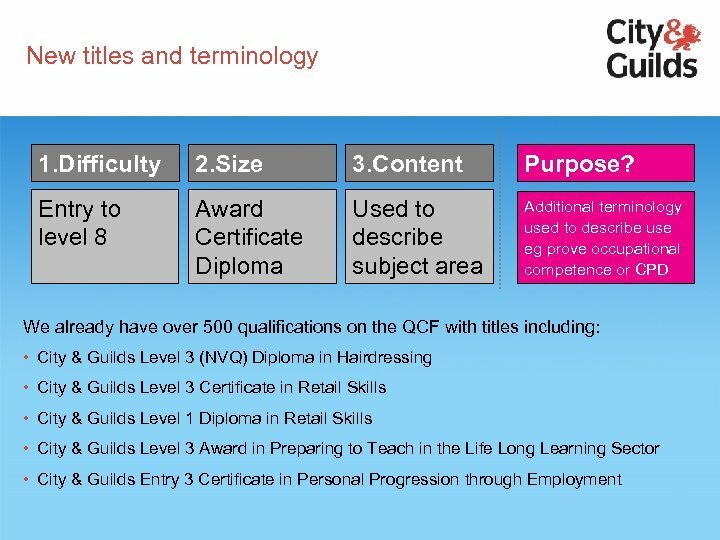 Qualification purposes will replace ‘types’ for categorising qualifications. 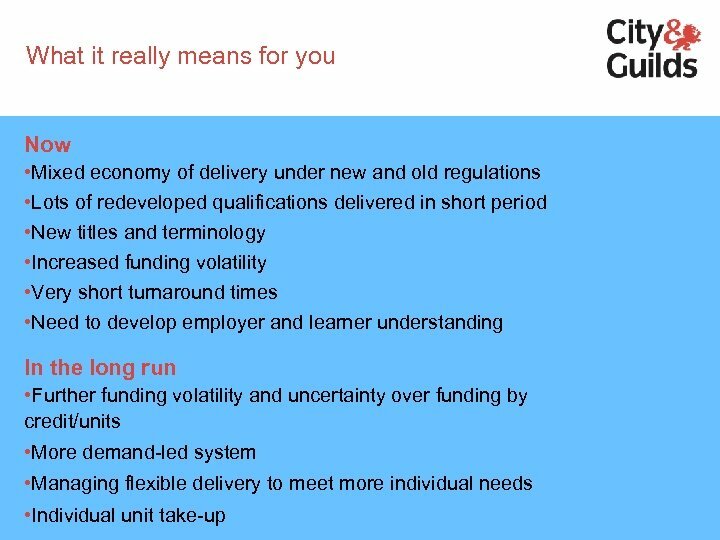 Still some uncertainty on funding and development timelines in some sectors. 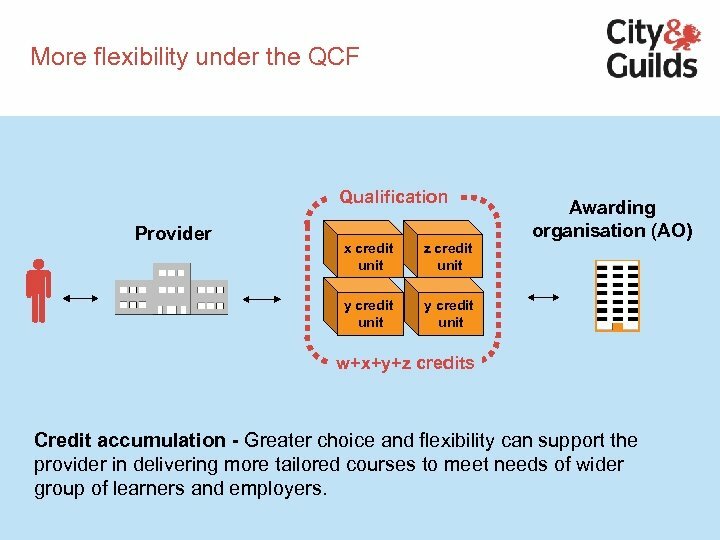 More flexibility under the QCF Qualification Provider x credit unit z credit unit y credit unit Awarding organisation (AO) y credit unit w+x+y+z credits Credit accumulation - Greater choice and flexibility can support the provider in delivering more tailored courses to meet needs of wider group of learners and employers. 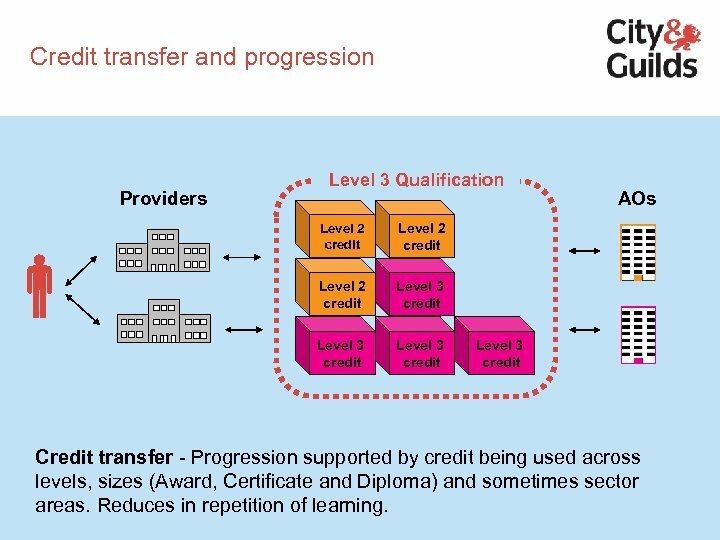 Credit transfer and progression Providers Level 3 Qualification Level 2 credit Level 3 credit AOs Level 3 credit Credit transfer - Progression supported by credit being used across levels, sizes (Award, Certificate and Diploma) and sometimes sector areas. Reduces in repetition of learning. 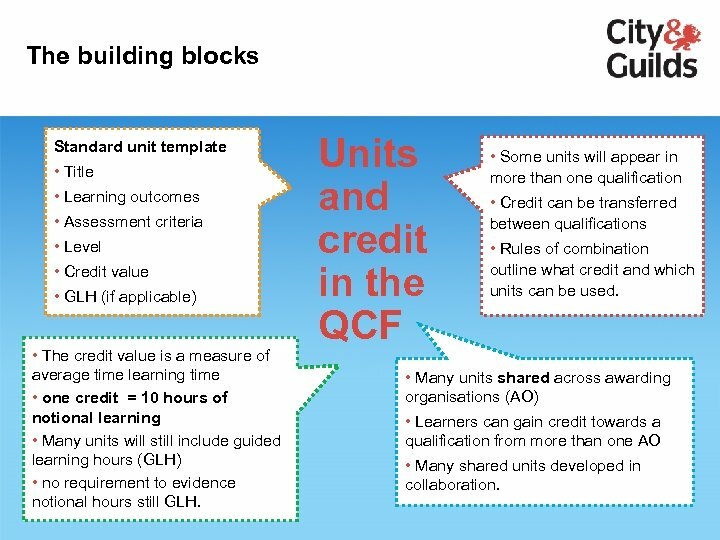 The building blocks Standard unit template • Title • Learning outcomes • Assessment criteria • Level • Credit value • GLH (if applicable) • The credit value is a measure of average time learning time • one credit = 10 hours of notional learning • Many units will still include guided learning hours (GLH) • no requirement to evidence notional hours still GLH. 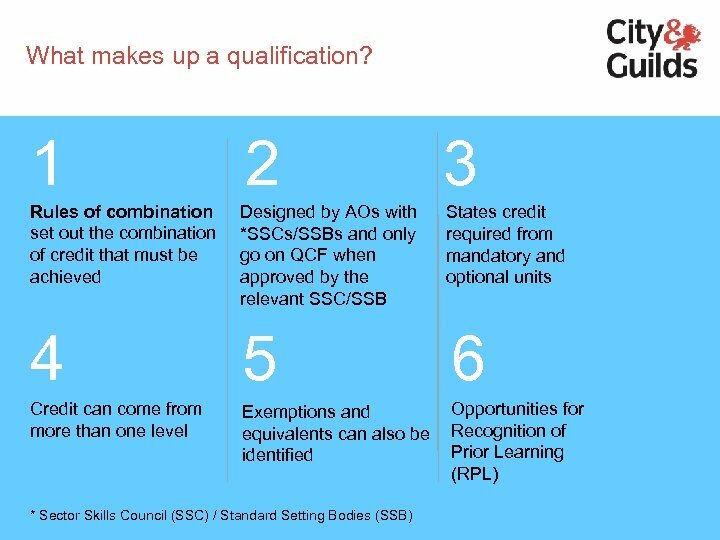 Units and credit in the QCF • Some units will appear in more than one qualification • Credit can be transferred between qualifications • Rules of combination outline what credit and which units can be used. 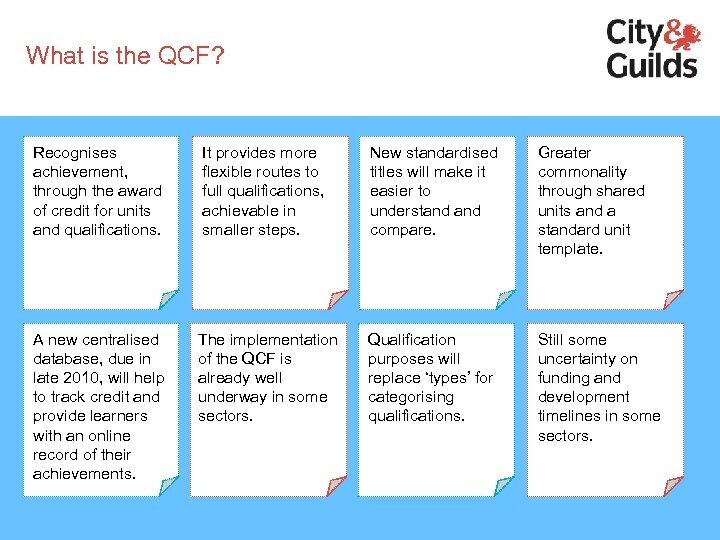 • Many units shared across awarding organisations (AO) • Learners can gain credit towards a qualification from more than one AO • Many shared units developed in collaboration. QCF qualifications 1 credit = 10 hours of learning. 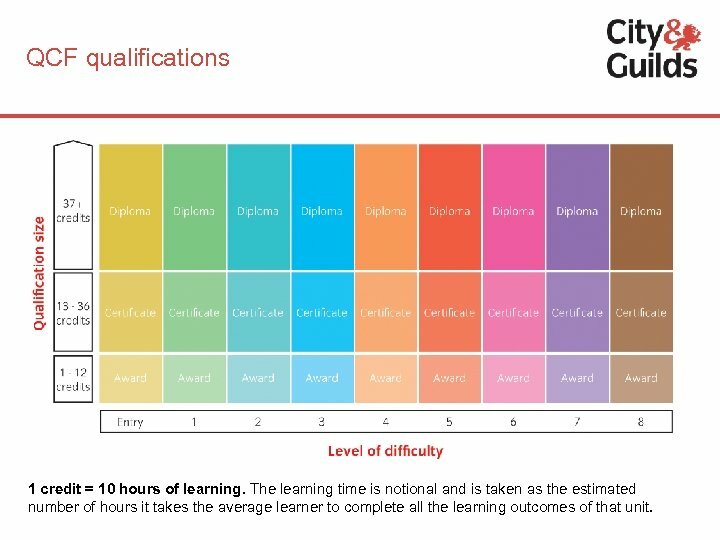 The learning time is notional and is taken as the estimated number of hours it takes the average learner to complete all the learning outcomes of that unit. Impacts – things you need to consider Senior Management Do your have a clear strategy and action plans in place to deal with the changes? Curriculum planners When will your provision be redeveloped? Are you preparing for more flexible delivery? 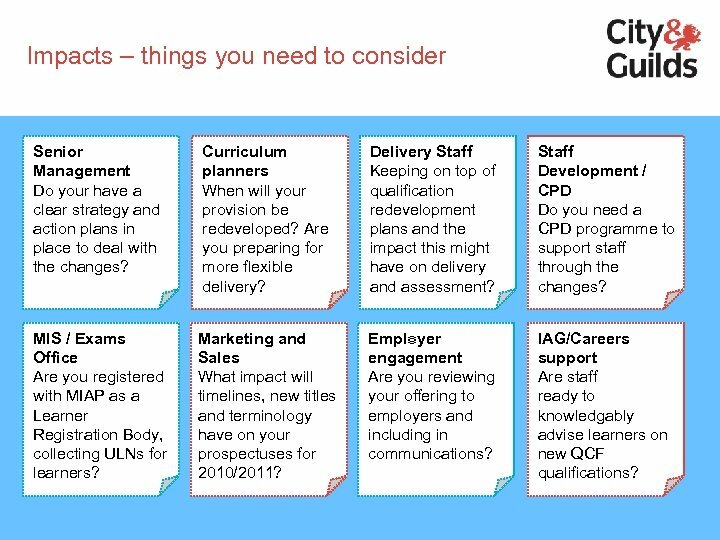 Delivery Staff Keeping on top of qualification redevelopment plans and the impact this might have on delivery and assessment? Staff Development / CPD Do you need a CPD programme to support staff through the changes? MIS / Exams Office Are you registered with MIAP as a Learner Registration Body, collecting ULNs for learners? Marketing and Sales What impact will timelines, new titles and terminology have on your prospectuses for 2010/2011? Employer engagement Are you reviewing your offering to employers and including in communications? 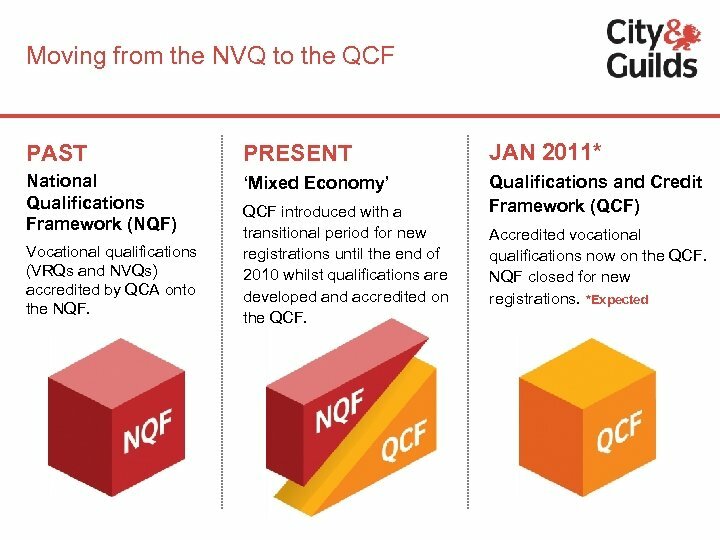 IAG/Careers support Are staff ready to knowledgably advise learners on new QCF qualifications? 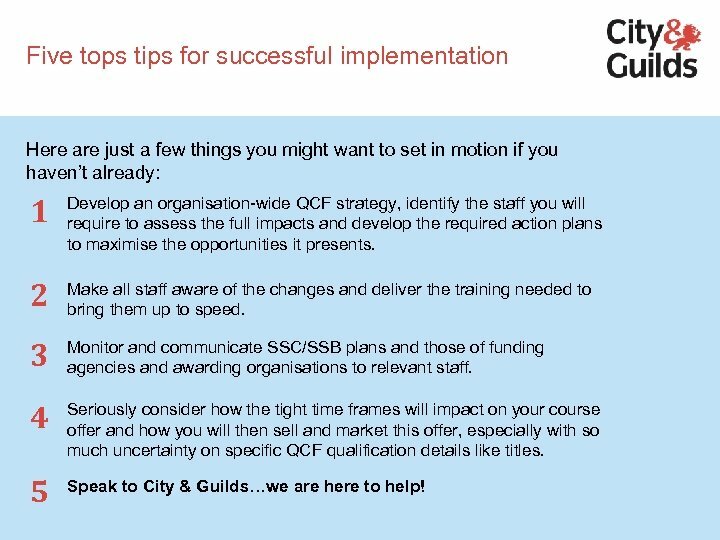 Five tops tips for successful implementation Here are just a few things you might want to set in motion if you haven’t already: 1 Develop an organisation-wide QCF strategy, identify the staff you will require to assess the full impacts and develop the required action plans to maximise the opportunities it presents. 2 Make all staff aware of the changes and deliver the training needed to bring them up to speed. 3 Monitor and communicate SSC/SSB plans and those of funding agencies and awarding organisations to relevant staff. 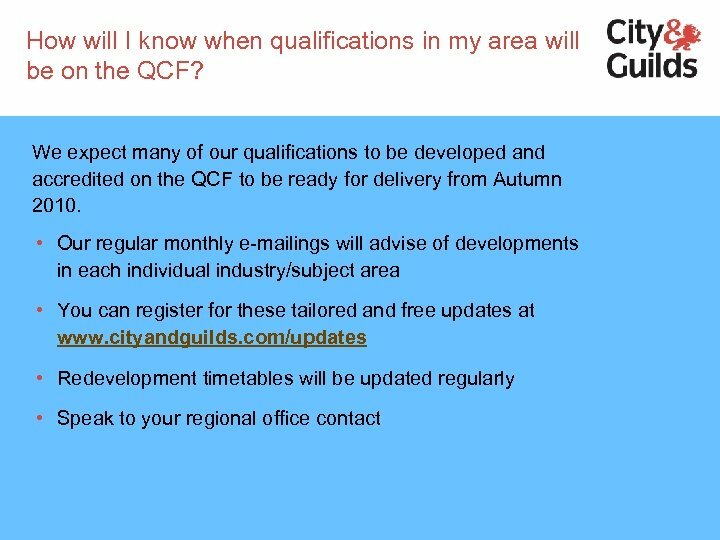 4 Seriously consider how the tight time frames will impact on your course offer and how you will then sell and market this offer, especially with so much uncertainty on specific QCF qualification details like titles. 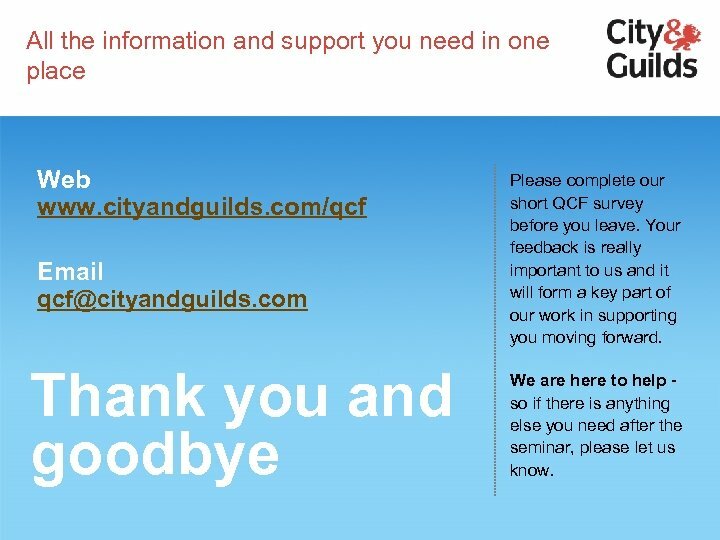 5 Speak to City & Guilds…we are here to help! All the information and support you need in one place Web www. cityandguilds. com/qcf Email [email protected] com Thank you and goodbye Please complete our short QCF survey before you leave. Your feedback is really important to us and it will form a key part of our work in supporting you moving forward. We are here to help so if there is anything else you need after the seminar, please let us know.